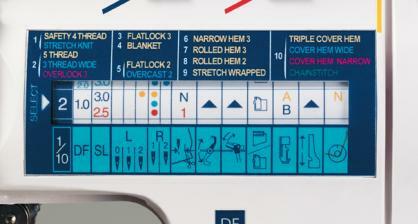 The easy-to-use Elna 845 gives you professionally finished seams, quickly sewing and trimming at the same time. You have a choice of a wide range of built-in stitches, too. The 845 model offers a new feature � top cover hem stitch. Now you can sew three different widths of top covers (triple, wide and narrow) showing covering loops on both sides of the fabric.